Delicious pasta dish without the starchy pasta - 'zuchetti' strips are a tasty and healthy alternative. 1. Heat a little olive oil in a frying pan to a medium heat and lightly cook the strips of chicken. Remove the chicken when cooked and set aside. 2. In the same pan, add the onion, red pepper and garlic and fry gently until softened. 3. Once softened, add the can of chopped tomatoes and continue cooking just until the ingredients are combined well. 4. Add the chicken strips to the tomato sauce and stir in. 5. Add your choice of fresh herbs and season to taste. 6. 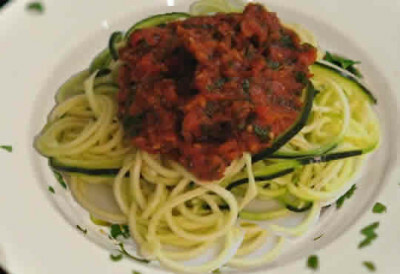 If you have sliced the zucchini (courgette) yourself and prefer it softened, you can do this by adding the zucchini to the tomato sauce and stirring in. The heat will soften the zucchini. Alternatively, you can lightly steam or stir fry the zucchini strips until softened. You will preserve many more of the zucchini's nutrients if you eat it raw. A spiralizer is perfect for this as it will cut very fine slices. Or you can take an extra minute or so to slice your zucchini finely by hand. 7. Pile the 'zuchetti' strips on to your plate and spoon the sauce on top. Add an extra sprinkling of fresh herbs to garnish if desired. 2 large zucchini (courgettes) - cut in half lengthways then slice each half thinly into slices resembling tagliatelle pasta. Or use a spiralizer to create the same effect quickly.